Douma, Douglas J. The Presbyterian Philosopher: The Authorized Biography of Gordon H. Clark (Oregon: Wipf & Stock, 2017), 318 pp. 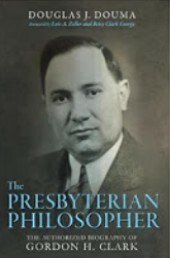 When the phrase “presuppositional apologetics” is used by most Christians, what is referred to is the method of apologetics taught by Cornelius Van Til, later popularized by his protege Greg Bahnsen. However, presuppositionalism is not limited to Van Til’s particular articulation of it. Indeed, at the time when Van Til’s apologetic was becoming widely known there was another presuppositionalist who was presenting a different version of the method. That man was Gordon H. Clark, the Presbyterian philosopher. Despite historical events leading to Van Til’s methodology becoming virtually synonymous with “presuppositionalism,” Clark’s apologetical contributions are widely recognized by many Reformed thinkers, as are his contributions to theology more broadly considered and his contributions to Christian philosophy. These contributions are: “(1)an axiomatized epistemological system, (2)teleological supralapsarianism, (3)a solution to the problem of evil, and (4)arguments for a traditional return to logic.” Chapter 10 of this work accurately, clearly, and succinctly summarizes these ideas, presenting Scripturalism in an accessible reading style to readers who may or may not be familiar with the intricacies of epistemology, metaphysics, and logic.